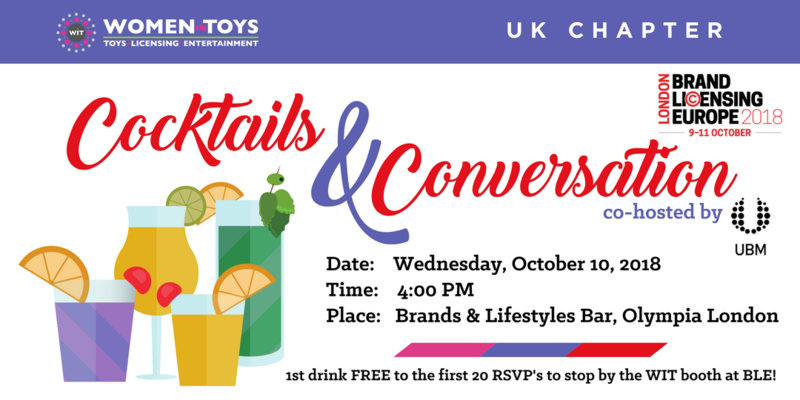 Please join us for a fun post-show cocktails meet up, co-hosted by Women in Toys, Licensing & Entertainment and UBM. Conveniently located inside Olympia London at Brands & Lifestyles Bar. Unwind after a busy day and network with WIT members, industry colleagues and friends. Please RSVP in advance and stop by the WIT Stand C120 to pick up a free drink coupon (limited to the first 20 people). COST: Pay your own way for drinks, but please RSVP.